As I have mentioned in previous articles in this series, when booking an award ticket, you are responsible for paying both the miles required as well as the taxes and fees associated with that booking. Aeroplan award redemptions tend to have higher taxes and fees than some of the other frequent flier programs. In this article, I’ll show you when the fees are high and what you can do to minimize those taxes and fees. Fuel Surcharges are charged for flights on certain airlines such as Air Canada, Lufthansa and Austrian, but not charged for others such as United and US Airways. As I have mentioned before, taxes and fees on Aeroplan award bookings will represent a significant amount of the cost of the ticket. In previous examples, we have seen that North America flights can cost 25K miles + $200 in fees. On the best days, you can sometimes buy a revenue ticket for less than the price of the “Taxes, Fees & Surcharges”. As a result it is important to understand what goes into that charge and what you can do to minimize it. Taxes and fees are a reality of life and if you really care to know what the specific taxes are, you can click on the Details link next to the Taxes, Fees and Surcharges for a breakdown. Most people living in the Western world accept that there are taxes associate with flying and simply accept them without giving them much thought on a daily basis. 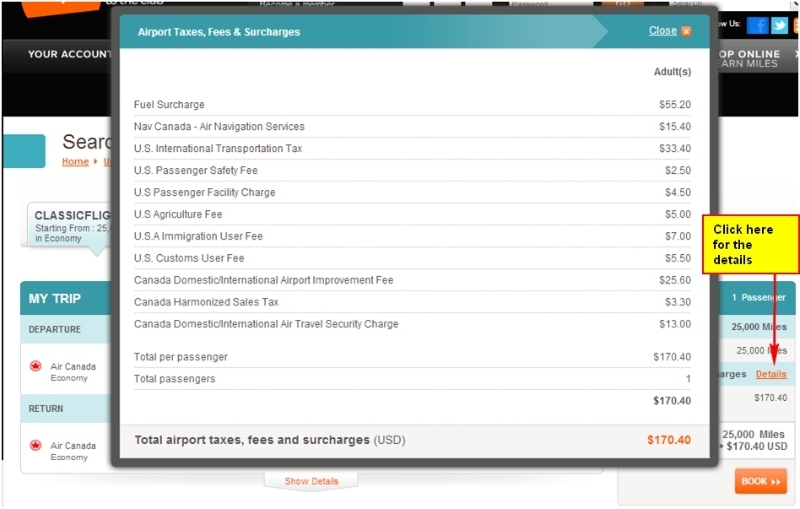 In terms of Aeroplan’s “Taxes, Fees and Surcharges”, much of the cost is actually not a specific tax that must be paid on all flights or by all airlines but the Fuel Surcharge. You can save some significant money by knowing how to pick the flights that will minimize the fuel surcharge and ultimately the total amount of taxes and fees. One of the biggest portions of the taxes and fees is the Fuel Surcharge. This piece is charged on flights operated by Air Canada. Often, for any given route there are flights operated by Air Canada as well as a partner. The fuel surcharge will be applied if the flights chosen are operated by Air Canada. The trick here is to choose flights that fly the same route but operated by partners where possible. This may not be possible for flights operated wholly within Canada. Let’s take a look at a flight from Toronto to San Francisco, where both Air Canada as well as their partner United operates flights on the direct route. We will use flights that are on the same dates, same route and around the same time for comparison purposes. We can compare the taxes, fees and surcharges that are charged for an Aeroplan redemption on this flight. At the same time, we will see what kind of taxes and fees we would be responsible for if we were to book those exact same flights using United MileagePlus miles instead of Aeroplan miles. The fees that are only applicable when redeeming Aeroplan miles are Aeroplan’s junk fees as they are clearly not government taxes. Remember that both Aeroplan miles and United MileagePlus miles can be used to buy flights operated by Air Canada or United Airlines. On the outbound award, $36 can be saved by picking the United flight. Also, that same Air Canada flight, if bought using United MileagePlus miles would be charged almost $50 less than if it were bought using Aeroplan miles. From the chart above, we see that there is a Fuel Surcharge and Nav Can charge that are applicable only to Aeroplan redemptions on flights operated by Air Canada. If you were flying this route, you would save $70 roundtrip just by knowing to select the United flights for redemption of miles instead of the Air Canada flights. Comparing Aeroplan & United MileagePlus redemption options, it looks like Aeroplan / Air Canada is adding $108 in junk fees for Air Canada flights and $37 in junk fees on United flights. Since Aeroplan adds these fees to their redemption, it makes their miles significantly less valuable than United MileagePlus miles. Another thing to note is that the taxes and fees are significantly higher for flights which are outbound FROM Canada to USA. Although we have berated Air Canada for charging a fuel surcharge on Aeroplan redemptions, they are not the only airline who engages in this practice. To give you an idea of how absurd the fuel surcharges can be, I looked at flying a 1-stop flight from Edmonton to Frankfurt. You are paying an extra $500 due to the fuel surcharge by flying on Air Canada and Lufthansa over United. The taxes and fees added to Aeroplan award redemptions can be very significant. Aeroplan redemptions for flights operated by Air Canada will come charge you fuel surcharges which can be very significant part of the taxes and fees. If you can fly on a flight operated by a carrier that doesnt charge fuel surcharges, such as United or US Airways. Sweet site , super pattern , rattling clean and use friendly . Don't subscribe All Replies to my comments Notify me of followup comments via e-mail. You can also <a href='https://www.creditwalk.ca/comment-subscriptions/?srp=518&srk=2648578ecea05c83754707575dc5a494&sra=s&srsrc=f'>subscribe</a> without commenting.